Your answer may depend in part on where you went to high school. Students at racially diverse schools, particularly black and Hispanic students, are more tuned-in to injustice than students going to school mostly with kids that look like them. That&apos;s one of the main threads of a new book by Carla Shedd, an assistant professor of sociology and African-American studies at Columbia University. 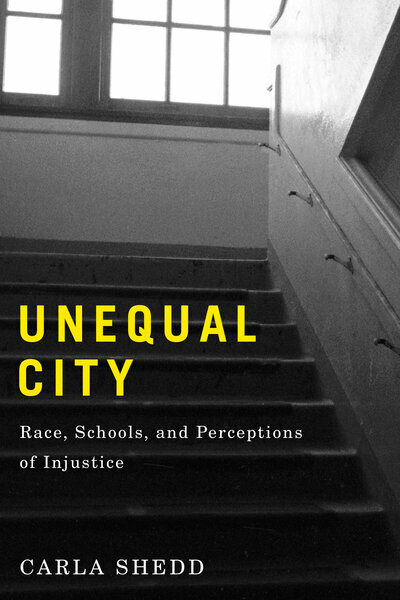 In Unequal City: Race, Schools, and Perceptions of Injustice, Shedd goes straight to the source: the students at four Chicago public high schools. She even let the kids pick their own pseudonyms. Two of the schools were largely segregated: one had no white or Asian students. The other two were fairly diverse — by Chicago standards — one with about a third white or Asian students and the other, a magnet school, with more than half. Shedd followed the schools from 2001 to 2011, a turbulent decade when the city demolished its infamous high-rise public housing units and began closing public schools in large numbers. 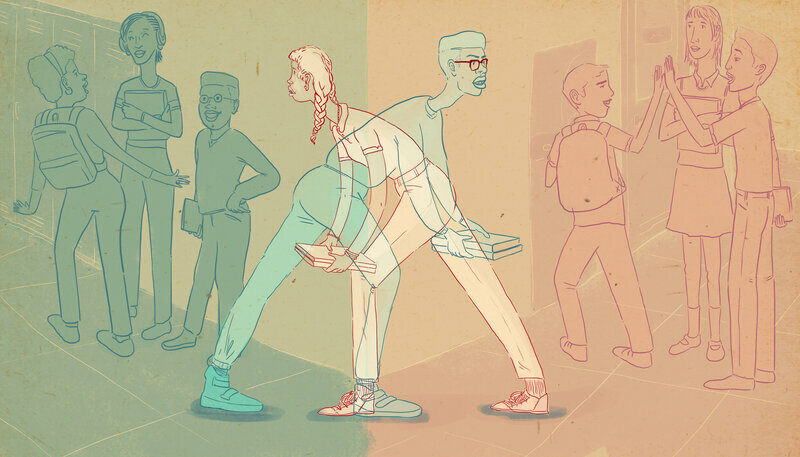 I spoke with Shedd about how school segregation can damage a student&apos;s sense of self. Let&apos;s jump right in. What did the students have to say? Black and brown kids going to their neighborhood school, many of them didn&apos;t have the concrete experiences to know that maybe their experiences are unequal. Those kids are very different from the kids who leave their neighborhood and go to a school downtown and sit with classmates very different from them. They see what&apos;s similar and they see what is different. This is mind-blowing for 14-, 15- and 16-year-olds who are making sense of who they are. It will form their perceptions of opportunity. So what does that look like from the student perspective? Both Alex and TB live on the South Side of Chicago in all-black neighborhoods. Alex travels all the way from the South Side to just north of Chicago&apos;s downtown for his school. He has a racially mixed group of friends and his experiences confirm both his privilege and his disadvantage. Alex went on a shopping trip with his friends to the mall downtown. So, he&apos;s in a mixed group of friends, they&apos;re doing something social, and a store security guard believed that one of their group members was shoplifting. The guard approached them and pulled out the three black kids in the group and told them they had to leave. Alex was really stressed by it. And the contrast is TB. He has been searched but not arrested multiple times. He still thinks the police are fair. I asked him, "How do you feel when this happens?" And he says, "Doesn&apos;t this happen to everyone?" It&apos;s almost normal for him. TB&apos;s school can&apos;t confirm that what he experiences is not the norm for everyone else. So, students of color in segregated schools might be less aware of inequality, but in diverse schools, they might be overwhelmed by it. Where&apos;s the balance? With kids in segregated schools, I talk a little about dosage. If they have a lot of these experiences with police — they&apos;re being stopped and searched — they&apos;re a little less naive. But for those who this hasn&apos;t happened to so many times, they see it as normal. It&apos;s almost protective in a way. What about the kids at more diverse schools, like Alex? In terms of the larger burden for other young people, it&apos;s also something that could be positive, to think about challenges, to think about inequality. It&apos;s a burden, but it&apos;s an important skill set that prepares them later on for inequality with a different face, for working in corporate America and being the only minority or walking down the street and having to disarm people who think they&apos;ll be robbed. How does this affect white students? There&apos;s a Filipino student who named himself Joaquin. So, Joaquin said after he leaves school, it&apos;s like different species go off into the world. You see the black kids go to a bus or a train line. You see the white kids walking to their homes, some of the most expensive real estate in the city, and the Hispanic kids going to the Brown Line to go to the West Side where they live. He talks about the flows of people at dismissal being so striking, because in school, he doesn&apos;t see that clash of species, as he called it, until everyone is dismissed. That&apos;s a very different experience for white students and perhaps Asian students. Otherwise in Chicago, they wouldn&apos;t necessarily have to be in a diverse environment, in light of the options they have for private and parochial schools. It&apos;s almost an anomaly that they&apos;re getting to interact with a diverse group of students. Otherwise they could just be in their segregated lives. Is your book an argument for integration? I&apos;m not saying kids that go to all-black schools can&apos;t have a great educational experience, but the resources are so starkly divided across these types of schools that are more racially homogeneous, and that&apos;s the problem. On the integration front, the positive is not just putting people of different races next to each other, but it also opens up different experiences and perspectives so they can share with one another and think within and across whatever boundaries there are: race, class, gender. It gives them a fuller sense of how the world works. What should we take away from your book? It is providing some nuance to how young people understand themselves in the world, and it&apos;s also having their voices heard. I want [readers] to think concretely about how what happens in school at this formative age shapes the lives of these young people, and it shapes the America we&apos;ll have.